If you have a Parallels Desktop perpetual license, you need to register it under your Parallels account. The subscription starts at the moment of registration. If you have a Parallels Desktop subscription, then your Parallels Access subscription starts right after you complete the online purchase or register your license under your Parallels account, if you purchased a boxed copy. Note: If you get a free Parallels Access subscription along with a subscription for Parallels Desktop, your current subscription is not extended for the free period. Please visit article KB 118695 for details. 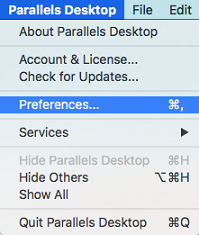 Once Parallels Desktop is registered and activated, go to Parallels Desktop menu > Preferences > Access and click Install. 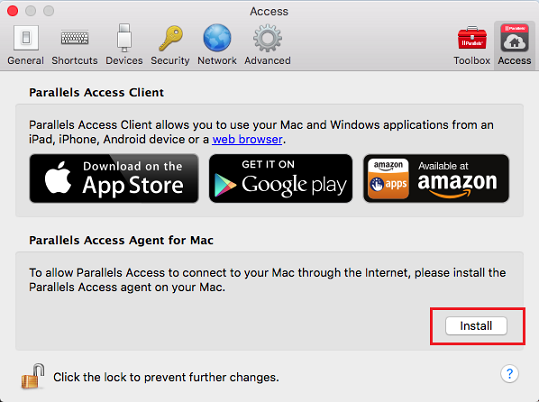 The process of downloading and installing the Parallels Access agent will be started. You can monitor the progress in the Preferences dialog. As soon as the Parallels Access agent is installed and started, it connects to the Parallels Access server automatically, using the credentials that were used for your Parallels account. Please go to the Parallels Access mobile application, sign in to your Parallels account and locate the remote computer you would like to connect to to start using Parallels Access. Q.: What should I do when a free Parallels Access subscription provided to me expires? A.: You can pay for the another subscription period in the Parallels Access mobile application: open Parallels Access and tap the Subscribe button located under the managed computer icon; or from https://access.parallels.com/#/computers.